1. 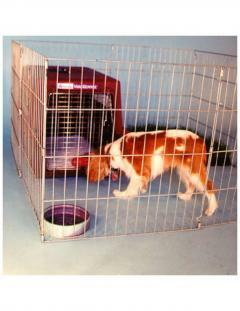 Keep your puppy closely confined to her doggy den (crate) or on-leash. 2. Every hour on the hour release your pup from confinement and quickly run her (on-leash if necessary) to the toilet area, instruct your pup to eliminate, and give her three minutes to do so. 3. Enthusiastically praise your puppy when she eliminates, offer three freeze-dried liver treats, and then play/train with the pup indoors; once your puppy is old enough to go outside, take her for a walk after she eliminates. 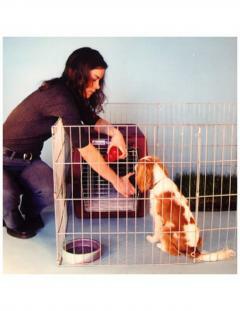 Before confining your puppy to his crate (doggy den), you first need to teach him to love the crate and to love confinement. This is so easy to do. Stuff a couple of hollow chewtoys with kibble and the occasional treat. Let your puppy sniff the stuffed chewtoys and then place them in the crate and shut the door with your puppy on the outside. Usually it takes just a few seconds for your puppy to beg you to open the door and let him inside. In no time at all, your pup will be happily preoccupied with his chewtoys. When leaving the puppy in his long-term confinement area, tie the stuffed chewtoys to the inside of the crate and leave the crate door open. Thus, the puppy can choose whether he wants to explore the small area or lie down on his bed in his crate and try to extricate the kibble and treats from his chewtoys. 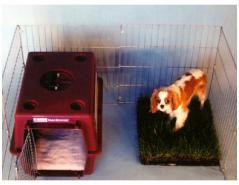 Basically, the stuffed chewtoys are confined to the crate and the puppy is given the option of coming or going at will. Most puppies choose to rest comfortably inside the crate with stuffed chewtoys for entertainment. This technique works especially well if your puppy is not fed kibble from a bowl but only from chewtoys or by hand, as lures and rewards in training. To use this method, each morning measure out the puppy’s daily ration of food into a bag to avoid overfeeding. Short-term confinement, whether to a crate or tie-down, is a temporary training measure to help you teach your puppy where to eliminate and what to chew. A dog crate is the best housetraining tool to help you accurately predict when your dog wishes to relieve herself and is the best training tool to help you to teach your puppy to become a chewtoyaholic. Once your puppy has learned to eliminate only in appropriate areas and to chew only appropriate objects, she may be given free run of the house and garden for the rest of her life. You will probably find however, that after just a few days your puppy learns to love her crate and will voluntarily rest inside. Your puppy's very own den is a quiet, comfortable, and special doggy place. If, on the other hand, your puppy is given unsupervised free run of the house from the outset, the odds are that she will be confined later on — first to the yard, then to the basement, then to a cage in an animal shelter, and then to a coffin. Without a doubt, housesoiling and destructive chewing are the two most prevalent terminal illnesses in dogs. 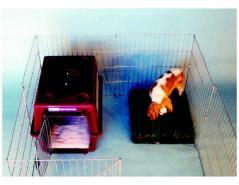 Using a dog crate will help you prevent these problems from ever developing in your puppy. Why not every 55 minutes or every three hours? Is it really necessary to do it on the hour? Puppies have a 45-minute bladder capacity at three weeks of age, 75-minute capacity at eight weeks, 90-minute capacity at twelve weeks and two-hour capacity at 18 weeks. Releasing your puppy every hour offers you an hourly opportunity to reward your dog for using a designated toilet area. You do not have to do this precisely each hour, but it is much easier to remember to do so each hour on the hour. Many people fall into the trap of taking their puppy outside or walking him so that he may eliminate, and when he does they bring him indoors. Usually it takes just a couple of trials before the puppy learns, "Whenever my urine or feces hits the ground, my walk ends!" Consequently, the pup becomes reluctant to eliminate outside, and so when brought home after a long jiggling play or walk, he is in dire need to relieve himself. Which he does. It is a much better plan to praise your puppy for using his doggy toilet and then take him for a walk as a reward for eliminating. Get in the habit of taking an older puppy to his doggy toilet (in your yard or curbside in front of your apartment building), standing still, and waiting for the pup to eliminate. Praise the pup and offer liver treats when he does: "Good dog, let's go walkies!" Clean up and dispose of the feces in your own trash can, and then go and enjoy a poopless walk with your dog. After just a few days with a simple "no poop—no walk" rule, you'll find you have the quickest urinator and defecator in town. Never reprimand your dog in a manner that is not instructive. Nonspecific reprimands only create more problems (owner-absent misbehavior) as well as frightening the pup and eroding the puppy-owner relationship. Your puppy is not a "bad puppy." On the contrary, your puppy is a good puppy that has been forced to misbehave because his owner could not, or would not, follow simple instructions. Please reread and follow the above instructions! For the best doggy toilet, equip a litter box or cover a flat tray with what will be the dog's eventual toilet material. For example, for rural and suburban pups that will eventually be taught to relieve themselves outside on earth or grass, lay down a roll of turf. For urban puppies that will eventually be taught to eliminate at curbside, lay down a couple of thin concrete tiles. Your puppy will soon develop a very strong natural preference for eliminating on similar outdoor surfaces whenever he can. If you have a backyard dog toilet area, in addition to the indoor playroom toilet, take your pup to his outdoor toilet in the yard whenever you release him from his doggy den. For a good indoor or balcony doggy toilet check out PetaPotty or The Pet Loo.